Unable to deny that "youths" play videogames, an Isreali council of settlers in the West Bank commissioned a game that lets players fight in the 6 Days War. The Residents' Councils of Samaria and Binyamin realized that today's children are not educated in the same ways they were years ago. 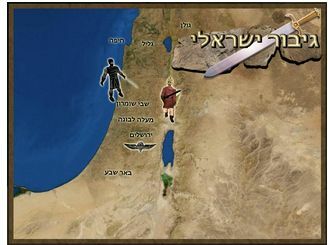 In order to make sure that the message of the Israeli way of life survived, the groups commissioned a company called Virtual 3D to create four games: Judah Maccabee, Ahab in Samaria, Ammunition Hill, and an untitled game that allows you to hang-glide and guide the people of Israel to the Holy Land. Itzik Shadmi, the chairman of the councils, hopes that these games will help guide his people just as well. "In education, one sometimes needs to take roundabout routes to reach the target in a better way. The road may be longer but it holds promise for better results," Shadmi said. "Today's youths are surrounded by external stimuli that change rapidly all around them, and we must be aware of this." Built using Shockwave to run in a browser, the games are all fairly low-tech and appear like primitive first person shooters. In Judah Maccabee, the player takes the role of an Israeli soldier from 166 BC who must steal a sword from the Appolonian camp and bring it to the eponymous priest, who led a revolt against the Seleucid Empire. Ahab in Samaria takes place in 870 BC as the player defends the city against invasion, while Ammunition Hill places the player in the modern 6 Day's War as a paratrooper tasked with blowing up a bunker in Jerusalem in 1967 using an Uzi. Yeah. A series of three-dimensional computer games. While playing them you will discover many interesting and important things about the Land of Israel, Jewish settlement in the Land of Israel, and its history. And most importantly: This is your chance to take part in historical events! Don't worry if you're the only one who thinks this is a silly idea. I never was one for edutainment myself.